Simply put, this property sits on one of the most gorgeous ocean-front locations in East Hawaii. Unlike other ocean-front homes, you will not need to walk to the end of a yard to appreciate the Pacific waves. Here, you will feel as if you are on a ship. 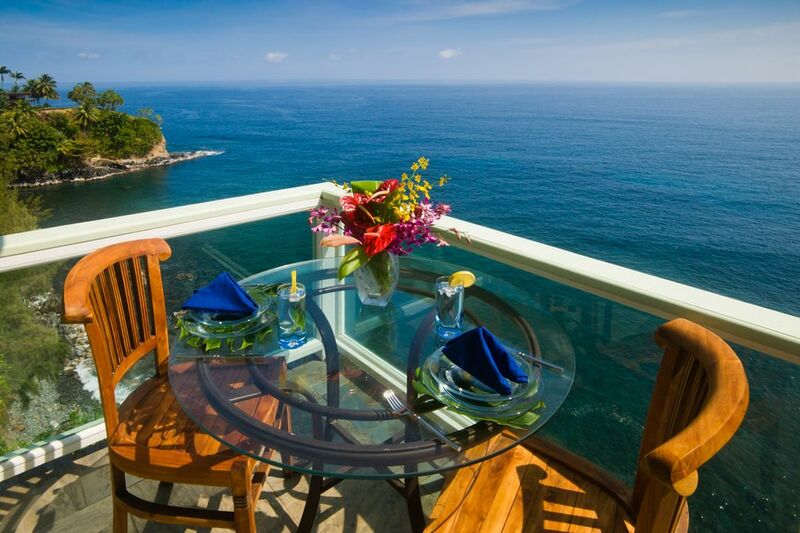 Simply step out onto the deck, look down and there is the Pacific ocean lapping at the shoreline below you. We have actually fished off the deck. We believe the quality of this view and proximity to dramatic breaking waves are unique among vacation rentals in East Hawaii. This is particularly so considering it is only a couple of short miles from quaint Hilo town, the seat of Hawaii County. During the whale season, humpbacks will breech and frolic so close to the house that, on occasion, it will seem as if they are putting on a show just for you. Sometimes the cove below is visited by schools of spinner dolphins, which number in the hundreds. At almost anytime, you can look out from the windows or deck and see surfers sliding down the face of silver waves at nearby Honoli'i beach. On most days, a giant cruise ship will sail out of the dawn and past the house in the morning and then past the house again at sunset, as it leaves Hilo Bay, festooned with a thousand glittering lights. The house is a 40 minute drive from Volcanoes National Park and a brief three minute drive from Hilo. It is perfectly located for exploring East Hawaii and a spectacular hour and a half drive from the beaches and town of Kona. Aside from the spectacular view, one of the benefits of staying next to the ocean is the lack of pesky mosquitoes. The ocean breeze, which will keep you cool, also serves to drive them away. Unfortunately, the Big Island has been invaded by coqui frogs in recent years, which make a loud chirping noise in the evening. Many B&Bs and vacation properties here actually supply their guests with earplugs. Luckily, the ocean breeze also keeps most of the coquis at bay. You will hear some chirping but it is extremely unlikely that you will find the noise too intrusive. The house has a large kitchen and living room with picture windows overlooking the ocean and across the bay to Hilo Town. There is a master bedroom with a king-sized bed and french doors leading onto the deck and an outdoor shower. The second bedroom has both a full and a twin bed. Each of the upstairs bedrooms has a large TV, full cable and premium channels. Downstairs from the deck is another bedroom/study with a futon (big enough for one adult or two two children) A/C and a TV with extended cable. This bedroom is separate from the house and is perfect for children or those seeking more privacy. This is the only room with air-conditioning and does not have its own bathroom. The living room features leather furniture and a gas fireplace, which serves to create ambiance rather than heat as the temperature in Hilo rarely drops below 70 degrees. We have deliberately not put a TV in the living area as we hope that you will enjoy the spectacular view, uninterrupted by flickering images and perhaps read, chat or partake in some of the family games we have left for you. However, there is double-speed wireless internet connection throughout the house should you need it for your own devices. You will find a pair of binoculars for observing the whales, surfers, dolphins, cruise ships, sailboats and Hawaiian outrigger paddlers. The deck features a large, expandable teak dining table with chairs. It is doubtful that you will want to eat indoors once you have experienced the pleasure of ocean-front dining, although there is an additional dining table in the living room, should you choose to. On the new deck extension there is a smaller table with chairs for a more intimate setting. There is an additional table with all-weather chairs and if you need it, a folding table. Should you wish to entertain, there is ample seating for your guests. For relaxation, there are teak deck-chairs and a comfortable, quilted double hammock in which to swing to the sound of breaking waves. Should you wish, grab a pillow with a blanket and let the hammock rock you to a wonderful night's sleep under the stars. The large kitchen is fully equipped with everything you need for comfort and convenience: extensive granite counter-tops, a double-door stainless steel fridge with water and ice maker, a dishwasher, garbage disposer, a Keurig coffee maker with a complimentary selection of coffees, large microwave, blender, rice-cooker, slow-cooker, toaster and range. There is ample china and silverware for all your dining needs. Should you need it, you will find two coolers for taking on your island adventures. Outside, you will find a kayak, life-vests, boogie boards and snorkeling equipment. Please feel free to use them to enjoy the magnificent Pacific ocean, which undoubtedly will provide you with many happy memories during your stay in Hawaii. You will also find tennis rackets and balls as well as some other beach games to enjoy. I have noticed that some vacation rental owners claim that their properties are much shorter driving distances to Hilo than is possible. Please bear in mind that any oceanfront property in lower Puna, claiming to be within the Hilo district, is at least a 50 minute drive from town, often a lot more. This home is special. It is with reluctance that we are having to leave it to live on Oahu. That said, it is nice to offset some of that reluctance against the knowledge that our home will be bringing pleasure into other people's lives. If our home brings you even a fraction of the joy it has afforded my wife and me, you will be blessed with wonderful memories from your stay. We couldn't resist this property. As a columnist for the local newspaper, I visited the house in 2004 and, like everyone else who came here, was stunned by the spectacular views. The house came onto the market in 2011 and we snapped it up. Three months later, after extensive remodeling, we moved in. The house is nearly 60 years old and despite a few minor quirky characteristics, has stood the test of time well. We plan to move back in a few years. This house and community are very dear to our hearts. This house is all about the view. The construction itself is typically Hawaiian, being built of Pacific redwood in the single wall construction style. To be sure, if this home were a modern house, there would be a few more polished details and the upkeep would be easier, but we love it the way it is. Being located on a quiet cul-de-sac has meant that our home is part of a small community within a wider community. Our neighbors are kind, friendly and full of the island 'aloha' which comes to all who live here. Only the room downstairs has A/C. The house has lovely ocean breezes, which keeps it cool but to protect electronics from the salt air in the smaller space there is an A/C unit. There is a washing machine that takes standard loads. There is a clothes dryer that takes standard loads, although we often prefer to hang clothes in the ocean breeze. It seems to keep them soft and fresh. The carport has a roof. Ample towels are provided. We ask that you use beach towels when taking them off the property. The lovely living room contains leather furniture, table, cushions, etc. We have not put a TV in there to promote conversation and quiet enjoyment of the spectacular views through the picture windows. The dishwasher is a medium range Sears model and works well. The refrigerator is a double door, stainless steel model. It has an ice-maker and chilled filtered water dispenser. The coffee maker is the latest model from Keurig. We will provide a complimentary selection of coffees for the first morning of your stay. The toaster is a four slice model. You will find everything you need to prepare extensive meals. You will find all the dishes, cups, utensils, pots and pans that you need to cook for a large family. Although there is a dining area in the kitchen and a dining table in the living room, we are fairly confident that you'll want to take all of your meals on the deck overlooking the ocean. Each bedroom has a large TV. The two main bedrooms have cable boxes and DVRs. The downstairs TV is wired directly for cable. We offer full cable and HBO, SHOWTIME as well as high-speed wireless internet. There is a small radio with speakers in the living room You can attach your own music source to it. There are books available, many of which are about Hawaii. We provide a selection of board games, jigsaw puzzles, etc. We offer two cribs for babies. Melanie, our property manager, will provide some toys if asked. The lawn and garden are for guests to use. Please help yourself to any bananas, citrus fruit, papayas and herbs you find. We offer a kayak, paddles and life vests for guests to use. The deck (lanai) is the focus of the house. It is where we relax and eat most of the time. You will find a large, expandable table, hammock and deckchair. We provide snorkeling equipment for guests to use. There are free tennis courts available in town and covered courts are available for a small fee. Although the downstairs room is not be wheelchair accessible, the upstairs is. There is a four inch step at the front door. However, I have a disabled friend who has visited and we had no trouble lifting his wheelchair up onto the threshold. We can arrange in-stay housekeeping and massage if required. The owner lives on Oahu but will always take calls and emails to help with any requests guests may have. The view is wonderful no matter which way you look. The pictures show exactly what the house looks like and the outside shower is enjoyable. The house was well stocked with anything you could need. Close to Hilo but far enough away to feel like another world. We had a great time here. Perfect views to enjoy from the lanai, there was everything we needed for our stay. They put a lot a thought into making it a great stay! My three sisters and I spent an enjoyable weekend at this piece of ocean paradise. The location couldn't be better. It is just minutes from Hilo located in a quiet neighborhood. The house is very clean and comfortable. Everything we needed was provided and I appreciated the instructions Saul left for us. We loved the sound of the surf and spent most of our time on the deck looking out at the spectacular view. We saw whales, surfers, and morning sunrise. Thank you for a wonderful experience! This house was the absolute perfect spot for our visit to Hilo. It was well stocked with everything we needed and spotlessly clean. Our son who lives and works on the island stayed with us so our family of 6 had an amazing time together. We loved the view, the outdoor shower and all the amenities of home. I highly recommend this place for anyone who wants a truly lovely spot to stay! If we ever come back to Hilo, we definitely would want to stay here again. The house and location are perfect! The house was very clean and comfortable. The deck was our favorite spot where we watched the waves, surfers, and cruise ships. The house has plenty of space and all the amenities we needed plus added bonuses of body boards and other beach supplies, board games, and a hammock. House is minutes from all the places we wanted to visit including downtown Hilo, airport (we took a helicopter ride), Akaka Falls, and the beautiful Botanical Gardens. A beach perfect for surfing and body boarding is only a 2 minute drive. Truly the most beautiful and peaceful place to stay. Our family enjoyed this beautiful home for four nights. The property is well cared for and fully stocked with everything you will need for a great vacation. The owners have clearly thought about guest comfort and convenience, providing beach equipment, puzzles, games, plenty of towels, a kitchen equipped for cooking nice meals, and even a guitar. We love this side of the island and there is so much to see and do here, but there is a temptation to just stay at home, enjoy the view, and relax. Our house is located a mere three minutes drive from downtown Hilo; a town which has all the amenities you would expect from one with a population of 40,000. The house sits on an ocean-front cliff on a quiet cul-de-sac in a very safe neighborhood. East Hawaii offers visitors a far more honest and intimate look at Polynesian island life and culture than other, more tourist-oriented parts of Hawaii. Although cruise ships do come into Hilo bay on an almost daily basis (and sail right past the house) the town itself does not rely on tourist dollars to survive. This is a real Hawaiian town, where people live, work and play without ever feeling a need to cater to tourists with the brash, artificial imagery and entertainment found elsewhere in the state. That is not to say that people here are unfriendly to tourists, far from it in fact. People here are kind and welcoming to everyone. Simply put, here you will not be bombarded with opportunities to spend money at every turn. I have lived in Hilo for most of the past 25 years. I enjoy Kayaking around Moku Ola (Coconut Island), which I can see from my deck. I enjoy the striking and always unexpected displays at the various Botanical Gardens and markets, around Hilo. I love taking visitors out to Akaka Falls (a 422 foot drop of remarkable beauty), which is just 5 miles away and of course up to Volcanoes National Park, which is a mere 35 minute drive from the house to see the steaming molten rocks. Sometimes my wife and I go down to Waipio Valley, one of the most spectacular and spiritually redolent places in the world. Sometimes we go up Mauna Kea to look at the telescopes as they come to life at dusk amid a frosty moonscape of craters. Sometimes we stay closer to home and walk down to Honolii beach to watch the surfers slip down the faces of glistening waves. At night there is often a performance in town or out at the University theater. Several times a year we are blessed with a visit from world class musicians and dancers, who have packed one of the large theaters in Honolulu and come down to the Big Island as a side trip. Sometimes we'll go out to see local talent on display. If you take the time to discover it, you will find that there is more extraordinary performing talent in Hilo than in towns many times its size. The Big Island is home to a creative community which is astounding in its scope and variety. What we don't have here is much glitz and glamor (although that said, a recent production of La Cage aux Folles at the beautiful downtown Palace Theater took everybody's breath away) What we have instead is painstaking artistry blended among the deep roots of Hawaiian culture and tradition. You won't find glittering shops and swank hotels but you will find a musician on a beach or a painter on a hill or a weaver in a hidden corner who will remind you of the depths of human feeling. The Big Island is more than twice the size of all the other Hawaiian islands put together. Whatever you seek from your Hawaiian experience, you will find here. From the winter snow-capped peak of Mauna Kea, to the white-sand delight of tropical beaches; from the lushness of tropical forests, to the striking moonscapes of volcanic lava fields; from the charm of old plantation towns to sumptuous modern resorts, it is all here on our island home. We hope that our clifftop slice of paradise will be the perfect base from which to explore the extraordinary sights, sounds and romance of Hawaii's Big Island. Come with dreams and expectations, leave with aloha and sweet memories of adventures enjoyed in the fabulous heart of the Pacific.